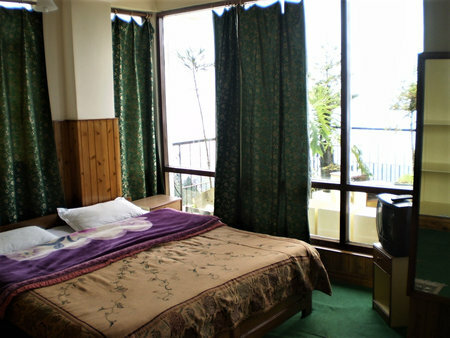 Grace Inn is a small and nice budget hotel located on a higher level and little away from the town center of Darjeeling. It is located next to Travelllers Inn on Coochbehar Road and about 15-18 minutes walking distance from the Mall. From the outside it looks like a two storied building. It actually has floors below the reception level at the basement. There is a Gospel Church on the upper floor of this building which was established in 1895. The church has a separate entrance from one side of the building and has no connection with the hotel. 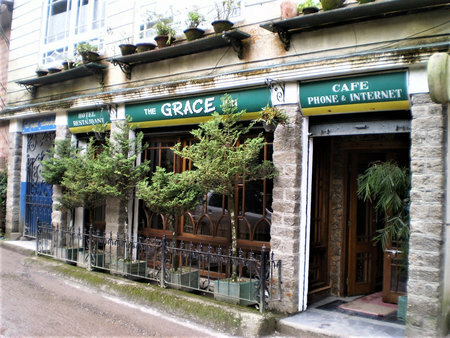 Grace Inn belongs to the Grace group of hotels that also has a resort in Darjeeling. From outside, the Grace Inn has a charming look with short height plants lined up in front. As you enter through the door, the reception counter is on the left. You can immediately notice the extensive wood work and paneling done all across the hotel. There is a staircase with wooden arms that leads down to the floors below the reception level. Suraj, the young man at the reception is a nice and friendly person. To the right of the reception is a nice cozy dining area or the in-house restaurant of the hotel. Actually the dining area extends along the corridor beyond the dining room. There are few tables and chairs laid out on one side of the corridor adding to the dining space. 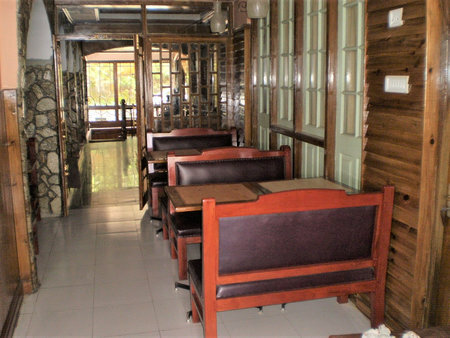 The restaurant serves Indian, Chinese, Continental and Himalayan cuisine, both veg. and non-veg. On the other side of the corridor there is a wonderful lounge or a reading room. 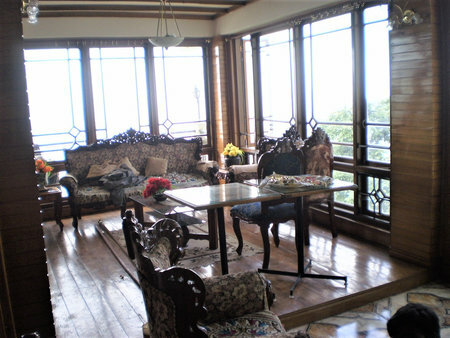 It has Victorian style sofas and chairs that can accommodate about 15 to 20 persons. The lounge is completely wooden paneled and provides a classy yet cozy ambience. There is a fireplace on one side which is lit up during the winter time. 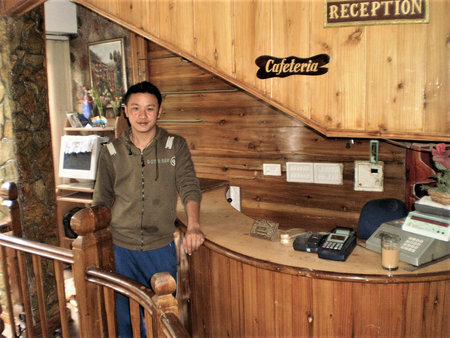 The best part of the lounge is its large windows on two sides offering marvelous view of the Darjeeling town and the snow capped mountain range. This place is ideal for the guests to meet up in the evening and enjoy a cup of tea next to the fireplace while reading books or magazines. At the end of the corridor and on its left corner is my favorite room (no. 001). The room is partially wood paneled and has wall to wall green carpet. This is the best view room of the hotel. The view of the mountains and the valley through the large windows are awesome. There is an open balcony at the end of the corridor and next to the room 001. This fairly large balcony can be accessed by any guest from the corridor. It's another lovely place to enjoy the panoramic views of the Eastern Himalayan range. There are chairs laid to relax and enjoy. Grace Inn offers standard and deluxe rooms, as well as dormitory. All rooms have standard amenities like color TVs with satellite channels, cupboards, phones through EPABX etc. The attached toilets are modern and provide hot water through the geysers. The geysers work when the main power supply is available. There is a small area left of the reception where there is internet connection provided through a PC. They accept credit cards. The check out and check in time is 12 noon. The hotel is located a little away from the Chowrasta Mall in a relatively quiet place. It's a nice choice if you are looking to have great views (not available from all rooms though) while staying within 15-18 minutes of walking distance from the Mall. The reading room and the open balcony at the reception level are really great places to enjoy magnificent views. The rooms below the reception level are little darker and do not have such great views as the room 001. 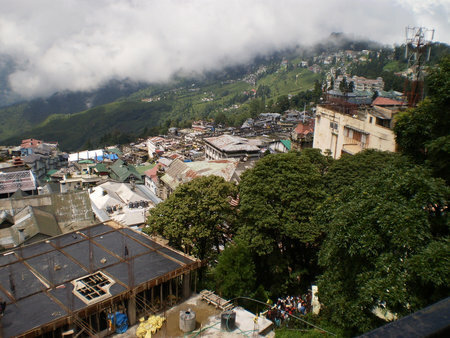 The service is okay and in line with any other budget hotels in Darjeeling. There are no great shops or restaurants close by except Petrichor, a great Art Cafe located within short walking distance. Grace Inn is located adjacent to the Travellers Inn. From the Mall it would be an uphill walk for about 15 to 20 minutes along Zakir Hussain Road. As youwalk up, Grace Inn is on the right side of the road. Vehicles can up to this point from the other side. I had stayed several times in grace inn. Its a good hotel and overall the manager Suraj is very supportive.